If you're interested in a trophy trout stream that regularly yields heavy-bodied browns and rainbows, you should consider the Provo River in Central Utah. During the first week of March, I accompanied a group of snow skiers to the town of Park City, Utah. While the skiers went to the mountain, I packed my waders and fly rod 26 miles south of Park City to the quiet town of Heber City, population 4800. 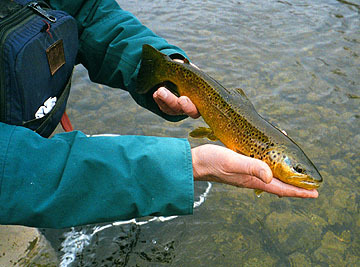 The Provo River runs through the Heber Valley and consists of two separate tailwater fisheries. The new Jordanelle Reservoir and Deer Creek Reservoir bound the upper and middle river and the lower river is between Deer Creek Reservoir and the city of Orem. 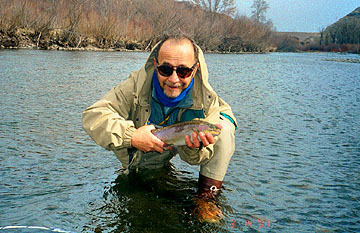 Weeks before the trip I contacted the Park City Fly Shop and was able to arrange a guided trip by owner, Chris Kunkel. Chris has 14 years guiding the Provo and he proved his knowledge by showing an average fisherman like myself that even I can enjoy a 30-fish day. We nymphed the cold and snowy mornings with scuds and midges and after 1PM fished a combination of nymphs, dry midges and BWO. I fished for four additional days and was equally successful most days. It seemed the colder (30 degrees) the cloudier, the windier and the snowier it got the better the fishing. I know for sure that I'll return to the Heber Valley. If you're interested in a trip, give me a call and I'll share my access maps and telephone contacts with you.